The Lawrence Tune Years will create endless debate. As CL had little to do with Series 1's please post comments in this section rather than in the Series 1 section. After reading you last message I was wondering: did you read the last book from Chris & Jake? If you read that book, you will understand that the number of REAL x what was mentioned for years in other books. This book "The Lawrence Tune Years" tells us that a +4 SS is a two seater with an aluminium Serie IV or Serie V body. Of course with a Lawrence Tune engine, 42mm Webers and Derrington 4/2/1 exhaust. So, your list is no longer what it was...... Now you have to make two lists: One with the real "stuff" and the rest are +4's with an LT engine. You've mentioned the above a couple of times in posts but so far in Chris and Jake's book I have not read this statement concerning +4 SS as only being those with 4/4 series IV or V bodies. Which page are you referring to where this statement is made? In the Dec 30, 1960 issue of Autosport for example there is a review of the prototype +4 SS but TOK at this time does not have a 4/4 body and neither do the early +4 SSs built. This "history" seems at odds with your interpretation? From what I have read in "The Lawrence Tune Years" and other sources, including the model description on my log book, to me at least it seems that the +4 SS started out (Feb '61-Mar '62 at least) with the existing +4 body and this later evolved for well known reasons into the low-line for Le Mans '62 and subsequently manufactured cars. Now....why was this white +4SS dispatched in Feb when the next wasn't dispatched till June??? Do we believe these lists? Also in the test of 'old TOK' ("prototype SS") John Bolster (Autosport Dec 1960) states that he hopes to try the new SS in the Spring....so a SS dispatched in Feb?....I'm not sure I believe this. Then we come to the 5th "SS" 4840......Mmmmmm! From what I have read I have no reason to doubt Ken Hill's list - on the basis that he or someone trawled through the factory build sheets and picked out the cars labelled as such. My copy of the build sheet only covers the build of FOJ (and cars immediately before and after) and that is labelled 'Super Sports'. If all the other +4SS cars are similarly described then it wouldn't be too difficult. In terms of 4749 (the first +4SS - originally registered 698 CWP I believe), I've just read an article on the car and it concurs with the factory despatch date and adds that it went to Gordon Adams of Warrington. Using FOJ as an example, the despatch date recorded in the factory build sheet is two days after the car was first registered (date from the original log book) so this one example at least shows some accuracy in terms of what was recorded by the factory. So working on the assumption the factory build records are the basis for the list and the accuracy of information/dates is sound was 4749 perhaps the car John Bolster might have been alluding to? Was he told this car was in production or about to go into production and would be ready in the Spring? Is the 4 month gap between the first +4SS and the next perhaps a case of the marketing and simply turning around initial orders? Certainly from June '61 onwards there's a steady trickle. - 4749 was brought over to Cheltenham for the Centenary in 2009. Details displayed with the car included "date of manufacture, February 1961, colour off white, sold by Acock and Brown to Mr. Gordon Adams who took delivery on 16.03.1961", the date the car was first registered. This information was provided by the owner of MOG 1 , Mr. Jeff Williams. Does this not also lend some support to the accuracy of Hills' lists and factory records. - one possible explanation for the gap between the February and June S/Sports could be in the Hill list of +4 Lawrencetune-engined cars, which are not regarded by the MMC as true S/Sports. There were 2 of these cars 4806, despatched 30.03.61 and 4820 despatched 26.04.61. Do these cars account for the alleged gap, just a thought ! - just by way of information to those who are not aware, many of the S/Sports are listed in the Registry on the website www.gomog.com. Worth a look if you are not familiar with the site, and includes +4, DHC, +4+ etc. which are not regarded by the MMC as true S/Sports. Where does this quote come from? Is this despite MMC recording early SSs as such in the build records and when registered by the factory on the log book? Maybe the factory were just practicing these descriptions for when the 'real' SSs came along later? Ken Hill's book lists the S/S, production numbers 1 to 104, as per factory records. He also lists "Plus 4 Lawrencetune-engined cars, which, for various reasons, are not regarded by the Morgan Motor Company as true Super Sports - factory record". There are 11 cars listed in this category, page 197 of his book "Completely Morgan". As 4749 was despatched 10.02.61 and 4806 and 4820 were despatched 30.03.61 and 26.04.61 respectively,I just wondered whether the latter 2 filled the gap before the S/S production run which seemed to get under way in June 61. Also these 2 cars seemed to be one-offs, 4806 a 4 seater and 4820 a DHC. I, for my part, am inclined to the view that Hill's lists are an accurate reflection of the information from the factory records. Would hope that the "source " records were correctly maintained......no reason to think not. With the fog now lifted your suggestion for the gap makes sense. There seems a fine line between factory recognised super sports and cars fitted with Lawrence Tune engines. Although I for one, accept Ken Hills list as a true reflection of factory records. For example, I have looked hard at RSB's video about his racing exploits in Morgan +4s....XRX1 and TOK. Take 4840 or XRX1...recognised as a SS....and the 2nd delivered to the UK. But...being a highline car, it doesn't have (or need) the remote header tank, the bonnet scoop is crudely rivetted on and open at both ends, it does however have twin Webers. We assume it had an aluminium body. 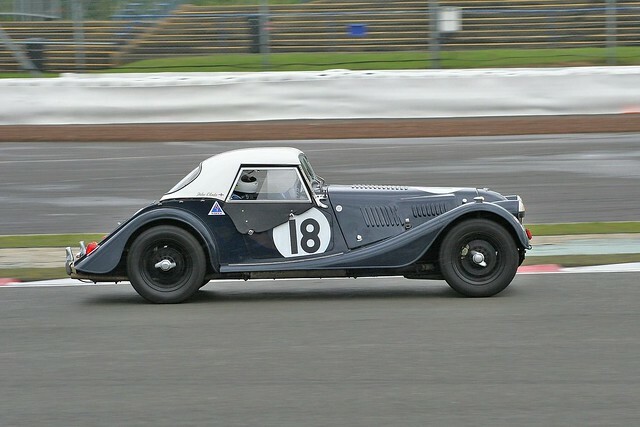 The side lights were removed from the top of the wings, had front valance, oil cooler behind grill, twin filler caps (Monza type and traditional), front indicators on face of front wing, morgan badge on grill (rather than cowl), 20 gallon tank, perspex fly screen on bonnet ahead of windscreen, bucket seats, single pane perspex sidescreens, wing mirror as rear view mounted scuttle mirror, dash lights mounted at base of windscreen pillar (to illuminate race number).......and so it goes on. 5356 is on the list and this was supplied without an engine to a customer in the UK! First of all, I am happy to see that, finally, the discussion starts. (Ha,ha,..) I hope that this is based on opnion(s) after reading the book: The LT Years! Ofcourse I can understand that what you read on page 102 and 154 is information that doesn't make everybody happy. Personally I think that there was a moment in Morgan history that the MMC needed at least 100 cars with the "specification" Super Sports. So, they made a list with all +4's with an LT-engine. The reason for that was: homologation!! At least 100 cars must be built. (It very strange, that this was "important" for all car brands except for Ferrari. They NEVER made 100 GTO's!!!) That's precise the reason you read in some "old" books the number 101 and others mention that 104 +4's of that type where built. But have you ever seen a MMC catalogue with a +4 DHC Super Sports. Or a +4+ Super Sports? "Even in that" time the factory needed orders. If a new customer odered a +4+ with an LT-engine he (she) got it. Business is business. But, the only official MMC catalogues shows a +4 Super Sports (what I know) in the 1962 and 1962-3 issues. See, the specifications in the catalogues. I think Chris & Jake did a great research job. Spoke with the right people and didn't follow the (wrong) tracks from books of the past. Be VERY happy with your +4! If the original LT-engine still is in that car you can be extra happy!! If you see what is going on in the development of sales prices at classic car auctions, the real stuff goes sky high. I see H & H Classic Auctions have an early left hand drive Super Sports coming up for auction later this month. It is chassis number 5004, a highline car as it was dispatched To the USA on 5th December 1961. It is the 14th Super Sports built. It still has it's original TR 3 engine but is now Deep Brunswick Green (it was originally Broken White). It has been for sale for some time Machiel with the Aston Workshop near Durham who also host John MacDonald Morgans. I thought Bob would like to know this...! Confirming with the book The LT years, the following: you mentioned it is a highline. I say it is a standard +4 body. Conclusion: This is a typical example of a +4 with LT engine. Sorry, no super sports. But, there is more to tell about this car. Have to ask Hermen Pol. I remember me that he warned me for this "restauration product". Surely there is nothing ordinary about your Series One! as to Super Sports WOW !! As far as I remember: The car with chassis number # 5004 is "interesting". The point is that there are two (2!!) cars with this number # 5004. The original is in Sweden. Who will be the victum of this "auction"!